Need Volunteers to staff the Signature Drive. Any amount of time would be helpful and appreciated. Recall Wirch leader, Dan Hunt went "On the Record" with Greta van Susteren Tuesday Feb.28 9pm. All our energy and passion has gained national attention. Now is a good time to send a quick e-mail to the Republican State Senators who have stayed in Wisconsin waiting for a chance to vote and represent the people in their districts. Here is a list of the Wisconsin State Senators who are actually working for their paychecks. Not ONE word of the rally in the Kenosha News! What can we say? That was an awesome rally!! Over 600 people came to our rally today. The energy, the enthusiasm, the atmosphere of a packed room all contributed to an historic event. We are making history because we officially began the process to fire our AWOL Senator. Let's keep the spirit of the rally alive by working hard to fill our petitions with signatures and addresses of our families, friends and neighbors. It was a good day - it will be a better day when we have 18,000 signatures and can finally say to Senator Wirch, "Go ahead and stay in Illinois permanently." Keep those petition sheets circulating, we've got many more signatures to get! There will be at least one Rally on March 5th. Site and Time to be annonced soon. In the mean time, collect signatures and put your creative juices to work and win a Pizza. Come up with the most creative usable RecallWirch.com slogan and win a free Pizza. We'll try to award a winner each week for the remainder of the campaign. Each winning entry will be posted on this site, and your slogan will be available for all to print and use via pdf download from the website. The winning entry pdf files will also include the blue ribbon award. All 2nd and 3rd place winners will be entered into a contest for a chance to win a Pizza at the end of the campaign. WISN Channel 12 did a news story about the Recall Wirch Rally on February 26th. Wisconsin needs your help ! Choose the position(s) that works best for you and your skills. * Local Leader - coordinate the supporters, in your area of the district. * Dropper - drop handouts into newspaper boxes without knocking on doors. * Ringer - go door to door in key wards to get signatures. * Signer - we need 20,000 of you. * Hunter - simply call local businesses and ask for permission to stand outside their doors to get signers, and report back to the local leaders with a yes or no for the location. * Driver - deliver a pizza and gather signature(s) during "recallwithcheese" events. * Rallier - organized the mayhem, be a greeter, work the registration, petition or volunteer table(s), as well as passing out materials during rally events. * Runner - assist local leader as right-hand man/woman as needed. * Surfer - use facebook, twitter etc .. to get the word out. We only have 6 weeks. * Funder - donate some of your hard earned money. * YouTuber - someone with skills in making videos to post on the web as well as make news release material. Kenosha, WI – There will be a rally to kick off the effort to recall Senator Robert Wirch at 1 PM on Saturday, February 26 at the Brat Stop in Kenosha, WI. The state forms have been filed, the press conference has been held and now is the time to send a strong message! We are already over 300 strong! And all of us banded together can accomplish our goal of 18,000 signatures to let Senator Wirch know he should show up for work just like all of the hard working people he represents. Come be a part of history. Rep. Paul Ryan reacts to "Fugitive 14"
Watch Rep. Paul Ryan here. Channel 12 Interviewed Dan on the recall Wirch effort. Click here to see newscast. Kenosha, WI – The citizens of District 22 are keenly aware that Senator Robert Wirch has been off the job for seven entire days. We say…it is time for him to come back. 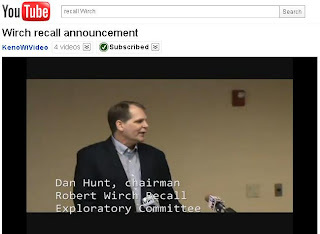 Chairman Dan Hunt of the Recall Wirch Exploratory Committee says “if Senator Wirch doesn't like his job enough to be in Madison to do it, we will make certain that he stays home permanently”. “This disruptive and unprofessional behavior is detrimental to the recovery of Wisconsin and it needs to end now”, said Hunt. What member of the Fleeing Fourteen said this? "I just bought my underwear -- I bought it myself." Burlington to Wirch, DO YOUR JOB! The Racine Journal Times has a story quoting Burlington residents and telling Senator Bob Wirch to do his job or face a recall. No, not the University, the town. Harvard, Illinois. Rumor has it that is where the Wisconsin 14 are in hiding. Harvard has METRA service, could it be that the Wisconsin 14 are there on a secret fact finding mission about commuter rail? Maybe they are in Harvard to learn how to be more friendly to business? Perhaps they are just clearing the way for their friends in Indiana? By the way, have you noticed the way the wording is on the stories like the one linked above? Anti-Union, isn't the truth really Pro-Taxpayer? Make sure to drop by the Recall Wirch page on Facebook. You call follow us on Twitter at http://twitter.com/recallwirch. Authorized and paid for by Taxpayers to Recall Robert Wirch, Erin Decker, Treasurer.